Camille Billops has used her art and her influence to speak out on behalf of those made invisible within the context of their times. In 1968, she was a member of the group that protested the Whitney Museum of American Art’s exclusion of black artists from an exhibition, The 1930s: Painting and Sculpture in America. Billops took an active part in the Black Emergency Culture Coalition’s (BECC) fight to incorporate the work of black artists in the major museums in New York, as well as the organization’s programs to teach prison inmates drawing, painting, ceramics and writing. Most importantly, today, she continues to advocate for people of color and women to gain their full rights as human beings. 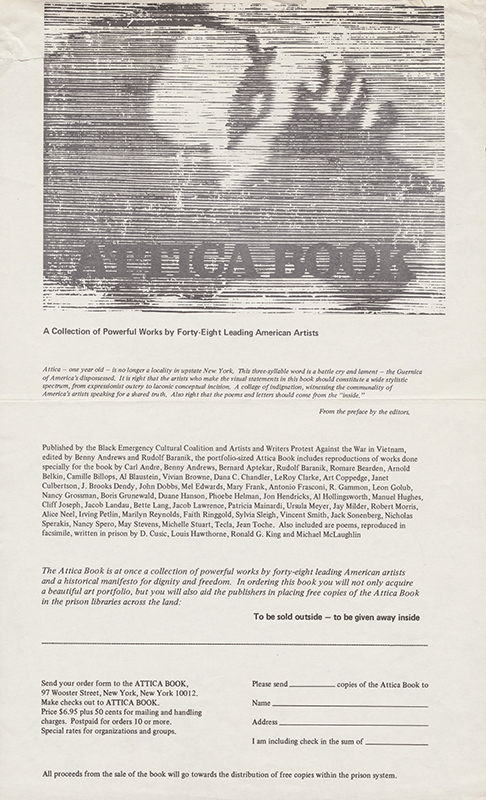 Faith Ringgold, "The United States of Attica: founded by the American people on September 13, 1971 at Attica Prison, N.Y. where 42 men gave their lives in an heroic struggle for freedom," April 15, 1972. On September 9, 1971, inmates took over New York’s Attica State prison in a non-violent protest against the inhumane conditions and treatment they were made to live under. Four days later, after failed negotiations between the inmates and corrections officials, the National Guard and state police stormed the facility. In the erupting melee of indiscriminate shooting, 89 people were injured and 42 killed, of which 30 were inmates and 12 were hostages. 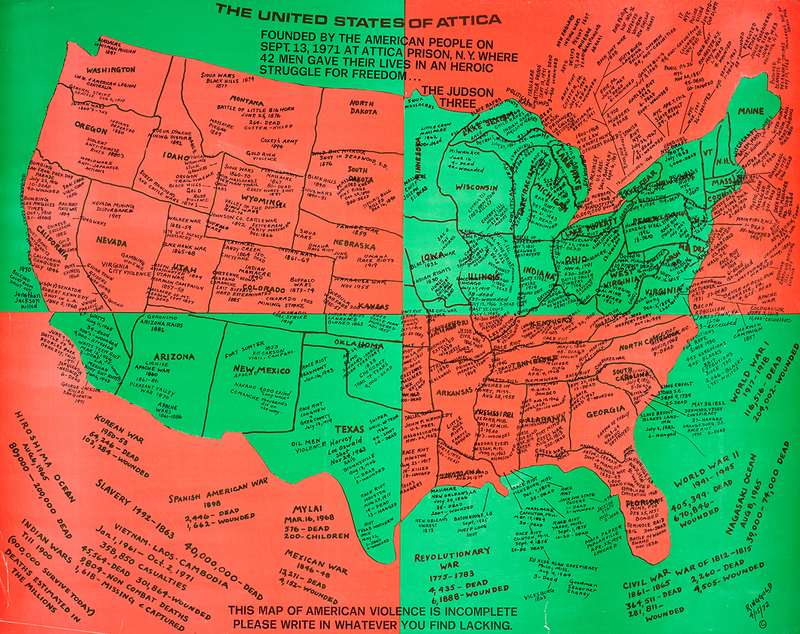 In response to the brutal massacre of inmates protesting the conditions of their incarceration at Attica State Prison, Faith Ringgold created this map to account for the history of brutalization in North America since before the United States was established. The poster also invites spectators to participate in a communal act of remembering and recording other acts of violence across America. The Attica prison massacre enraged New York artists and provided the impetus behind the creation of art as a form of protest against the destruction of human life. 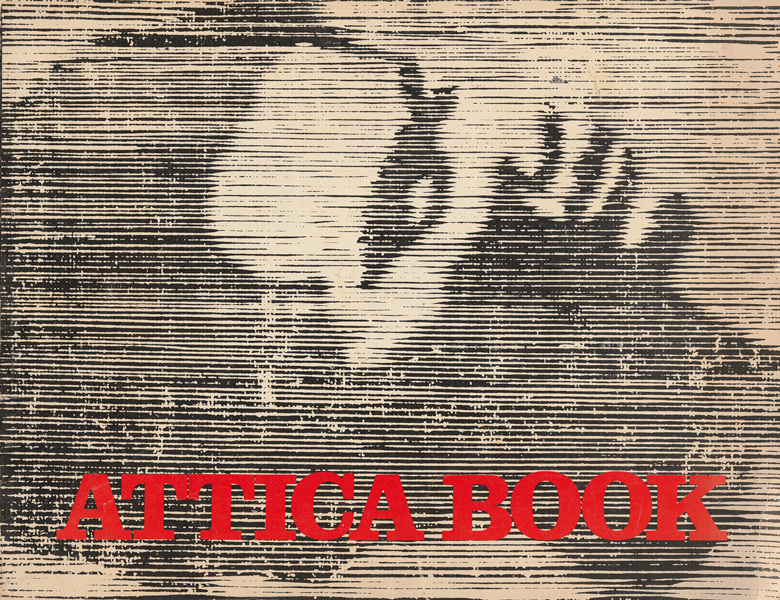 In response to the brutal killings, the BECC organized to help support the Attica Brothers Legal Defense Fund. Camille Billops’ contribution was a ceramic piece, representing the mangled bodies of those killed in the hellfire of bullets in the prison. 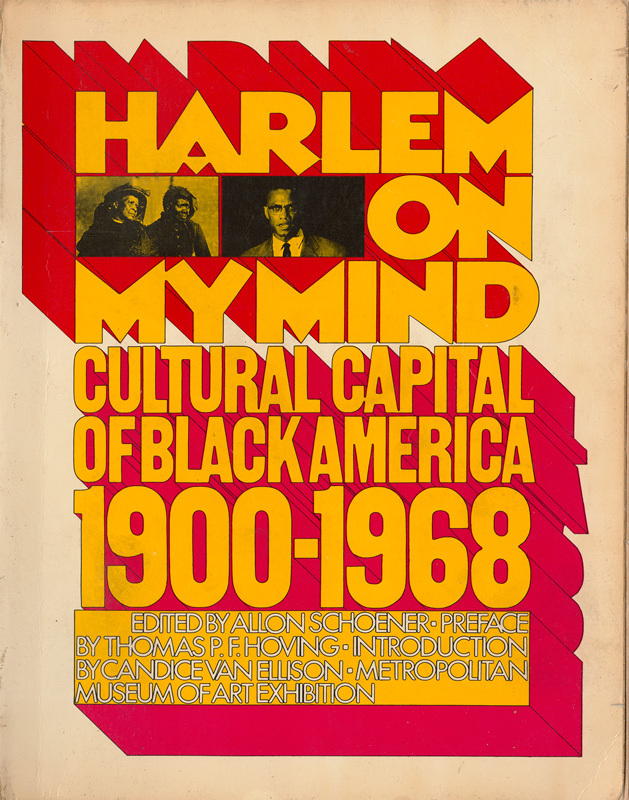 The BECC protested the "Harlem On My Mind" exhibition at the Metropolitan Museum of Art as well. At issue was the rejection of the black community suggestions about how it wanted to be represented, and the decision to display Harlem’s African American community through oversized photographs. Ironically, the exhibition excluded the art of major black artists who lived and worked in Harlem.